This Slow Cooker Beef Curry is a simple, prepare ahead midweek meal. A tasty ‘fakeaway’ curry, the slow cooked beef pieces are cooked in a tomato sauce. 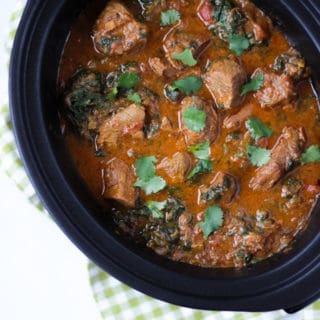 This crock pot beef stew style curry is also easily adaptable to the Slimming World or Weight Watchers plan as it’s light, healthy and low fat. Oh hi new favourite Friday night dish! This fakeaway is the perfect throw in a slow cooker in the morning, come home to delicious smells by dinner time, dish. 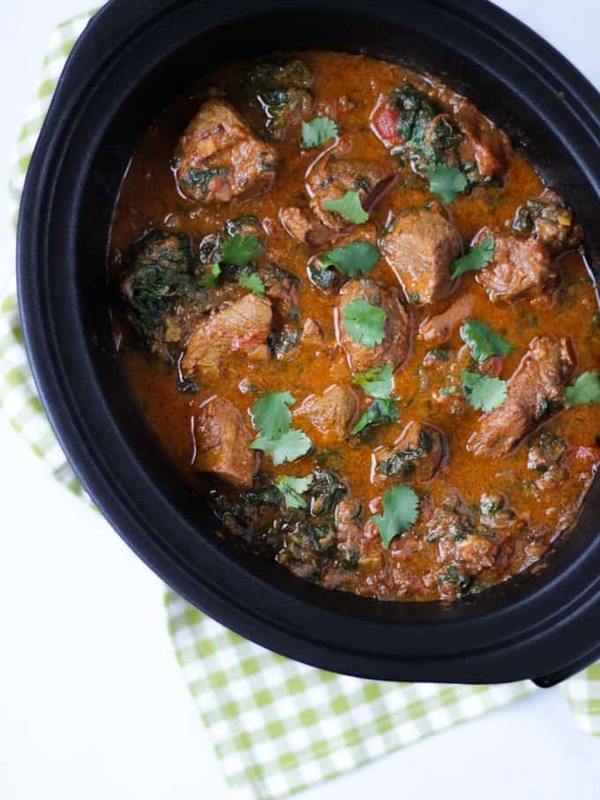 This Slow Cooker Beef Curry doesn’t use any cream or coconut milk so is lighter, lower in fat and can easily be converted to be suitable for the Slimming World or Weight Watchers plan. It freezes well, you can add extra vegetables and adjust the spice level to suit all of the family. What’s not to love? How do you make a Beef Curry? 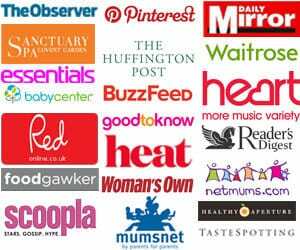 To make your Slow Cooker Beef Curry, start by marinating your meat with the paste and some yoghurt (if you’re following Slimming World or Weight Watchers, just substitute fat free yoghurt and curry powder instead of paste). If you can find the time to do this the night before, I think it really makes a difference to the flavour, but no panic if not. When you’re ready to rock and roll, fry off your chopped onions, garlic and ginger (use frozen chopped if you’re feeling extra lazy like me). Add the cumin seeds to pop. Next, brown your meat, I do this within the pan of my nifty new slow cooker. It’s so clever that the pan is super light and suitable for use on the hob too to save on washing up and catch all of those tasty cooking juices. Put the onions, meat and other ingredients into the pot, cook on low and then just add the spinach before serving. Slow Cooker Beef Curry done! How do I thicken a curry? At the end of the cooking time, add about 2 tablespoons of cornflour, mixed to a ‘slurry’ with water. Stir in well. (It’s really important to mix the cornflour with a little water first before adding, otherwise it will be lumpy. 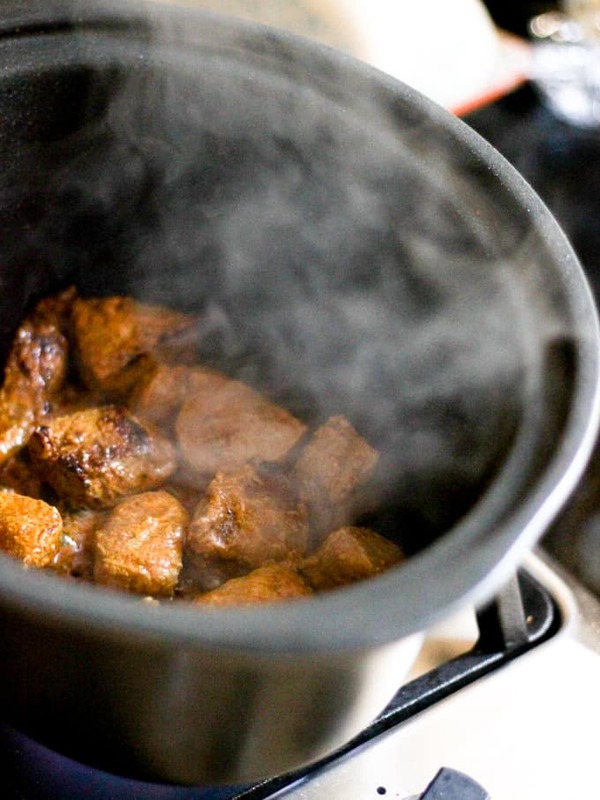 Either of those methods will work well for thickening this Slow Cooked Beef Curry recipe. What is the best cut of beef for a Beef Curry? I find that the best cut of beef for this Slow Cooker Beef Curry is chuck steak. Buy this from your butcher and ask him to cut into bitesized chunks. It’s got enough fat to keep the meat moist and tasty but is still fairly lean. If you’re buying from a supermarket, stewing steak will probably be the closest option. What can you serve with Beef Curry? You can serve all of the usual curry accompaniments with this Slow Cooker Beef Curry. Rice, poppadums, yoghurt with some mint mixed through and a salad of tomatoes and cucumber works really well. 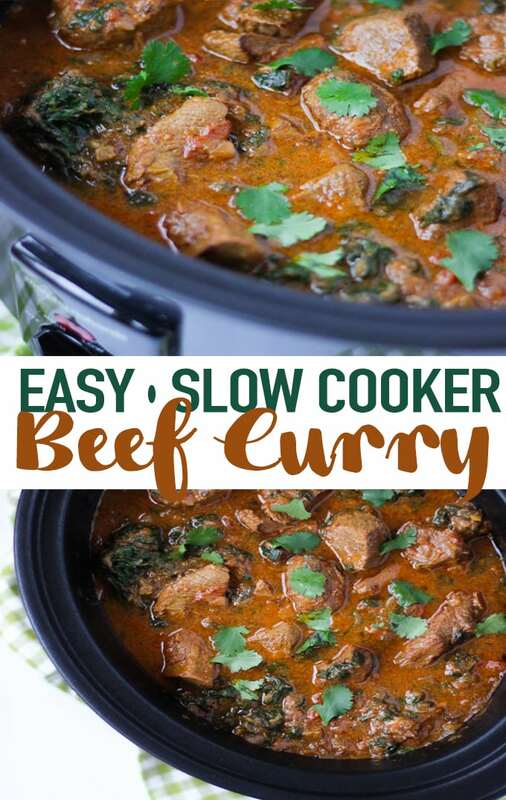 This truly is a really Easy Slow Cooker Beef Curry and so it uses a ready made curry paste. I make no apologies for this as sometimes, we all need speed over authenticity, don’t we? This does mean that you can mix and match and use the curry paste that you prefer. Rogan Josh and Tikka both work well. You can try adding different vegetables to this Slow Cooker Beef Curry recipe, butternut squash or sweet potato (added with the meat at the start of cooking) work really well. Fancy some other easy curry recipes? How about my Lamb Keema or my Easy Chicken Curry? Hope you enjoy this recipe as much as we do. 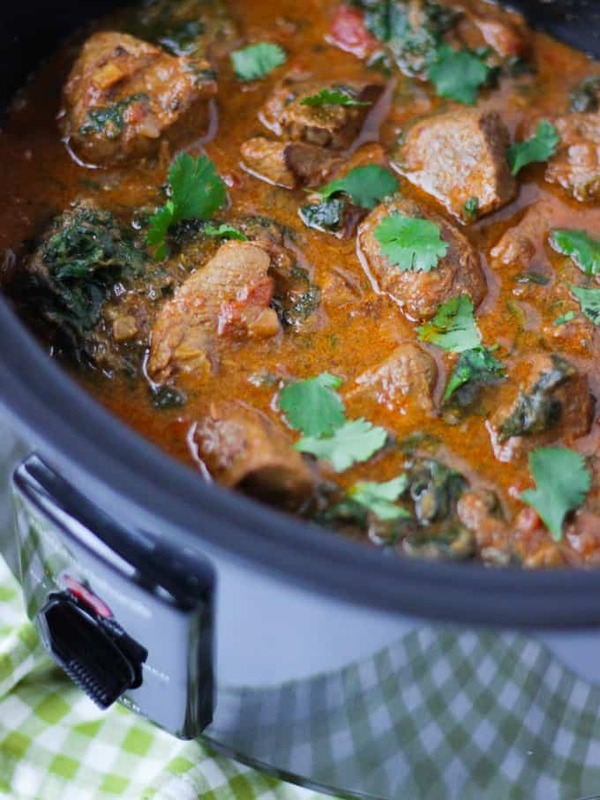 I’d love to know how you got on and what you thought of it if you make this Slow Cooker Beef Curry recipe. Please rate the recipe and leave me a comment below if you do. 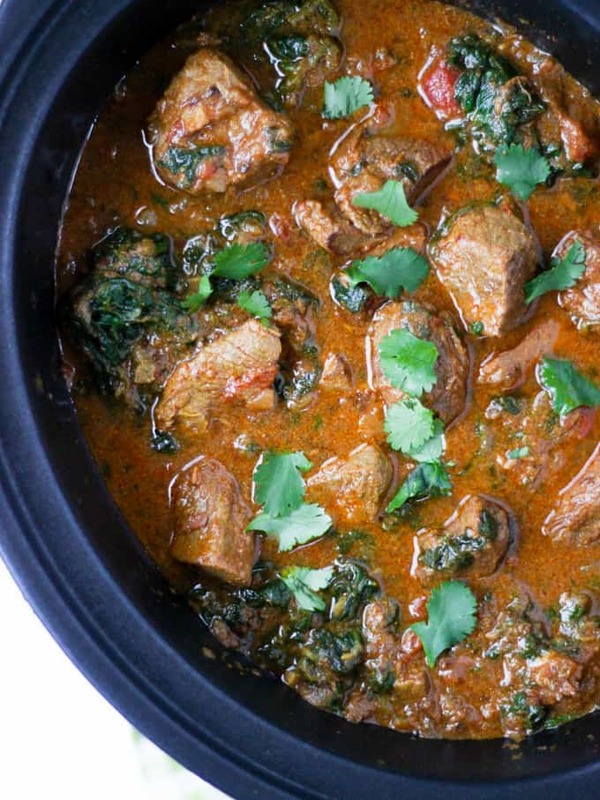 This Slow Cooker Beef Curry is a simple, prepare ahead midweek meal. A tasty 'fakeaway' curry, the slow cooked beef pieces are cooked in a tomato sauce. This crock pot beef stew style curry is also easily adaptable to the Slimming World or Weight Watchers plan as it's light, healthy and low fat. 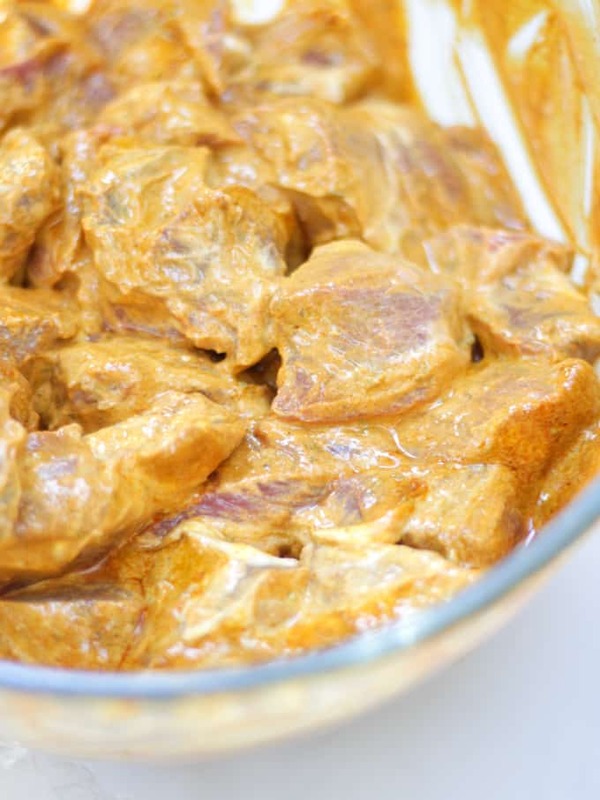 Marinade your steak pieces with the yoghurt and curry paste, overnight or for at least 2 hours if possible. When you're ready to cook, heat the oil in a pan (or in your slow cooker bowl if suitable for use on the hob). Fry off your onions, garlic and ginger until starting to soften (about 5 minutes). Add the cumin seeds and cook for a further 5 minutes. Remove from the pan and set aside. Fry off the beef pieces in batches until starting to brown. Don't worry that it will look a little wet with the yoghurt, if you use a high heat it will still brown. Add the onion mixture, browned meat, tomatoes, HALF of the Garam Masala (2 tbsp), the sea salt and beef stock cube, crumbled. Give everything a good stir, pop the lid on and cook for 4 hours on HIGH or 6 hours on LOW. Add the remaining Garam Masala and spinach, mix in thoroughly and leave for a few minutes to wilt. (If you're using frozen spinach this may take a little longer, allow 15 minutes or so extra). Stir thoroughly and serve with coriander (if using). Looks delicious, I am going to try this today! I see you add half the Garam Masala at the start of cooking, when do you add the rest? Thanks. Sounds delicious and I’m hoping to make it tomorrow – so I too wonder when the other half of the garam masala is added please? Ive just popped this in the slow cooker 🙂 – Ive added the half of Garam Masala – when does the other 2tbs need to be added?? This looks / sounds delicious. I have just purchased a pressure king pro. ( pressure cooker) can i follow your recipe using my pressure cooker? Can I use ground cumin for cumin seeds?